Today was my final market for the month - the Mister Market at Penrith Art Gallery with its 'macho' theme (to match the gallery's current art exhibition). I made one end of the table pretty much as masculine as Shelbyville gets (i.e. envelopes with cigar-band embellishments; nudes stickers; handmade bookplates in tobacco tins; vintage postage stamps; cassette tape cases filled with envelopes made from old atlas paper, comic book pages, and vintage British street directory pages and other 'blokey' found papers). And to display my items, I had my wooden type-tray, the black metal drawers, and a myriad of old cigar boxes, not to mention the chocolate-brown corduroy tablecloth - boyish enough I thought. Nice thing about today was the many cute little details... like the super-fantastic gingerbread men with their psychedelic icing + decoration. They started out at $2 a pop, but by the end of the day they were cut-priced to 50c each. I stocked up, and brought home a bagful of the multicoloured men. Yummo! Chi Chi's stall featured these sweet little birdy pouches (second from the left) which I mistakenly thought were teletubby-like faces with eyepatches until I inspected them closer. Duuuhhh. The eyepatch was actually a wing, and those weren't ears, they were beak and tail..! And this, my usual Shelbyville stall set-up. On the nearest corner you can glimpse today's new product - an edition of Nudes stickers created from my collection of life drawing sketches (but more about all the new products next post). And for the day's absolute cutest moment, check out this little girl doing her best Mr Puniverse impression - what a sweetie! On Sunday the 25th May, the Museum of Contemporary Art (MCA) hosted a zine fair as part of the Sydney Writer's Festival, and invited hundreds of zinesters to sell their wares in the grand Foundation Hall on the ground floor of the gallery building. It turned out to be a big day (and more than a little exhausting). But sooo much great stuff all under one roof! ^ The ol' panorama shot... gives a good idea of the size of the fair. ^ Plenty of people poured through the MCA's Foundation Hall, making for a nice + busy vibe. ^ Helen and Emma also came out to play. Their new zine, Cloud Television, made its debut at the fair, alongside Helen's first zine, Diagram. Visit Helen's blog Bowerbird Blues to find out more. ^ My favourite stall-buddy, Jojo, who's now a deft hand at the whole market stall thing! Jo's Little zine was very popular at the market, and rightly so! It was the first zine I ever read, and still one of my all-time favourites :) Little zine is available from issue #1 to #6, and the complete boxed set is alos now available - see Jo's blog for more info. ^ My Li'l Laundromatic also made its debut at the MCA zine fair. Essentially a miniature paper version of big-brother Laundromatic (see the original here) this little guy is A6-sized, full-colour, and is full of stories and pictures inspired by laundromats (who doesn’t love a good laundromat story??). 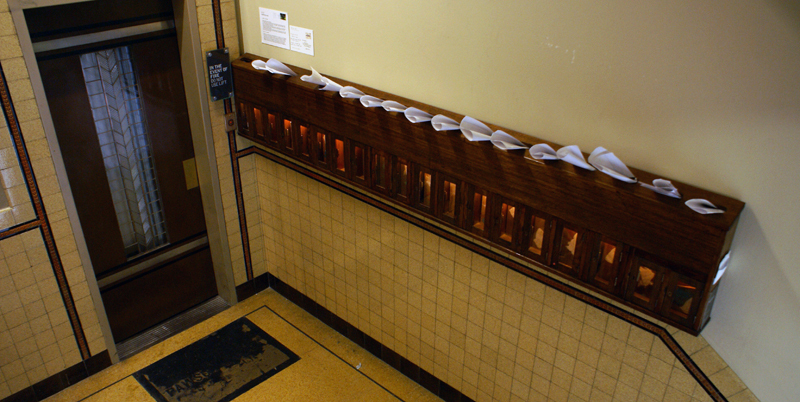 Oh, and each Li’l Laundromatic is also individually bound with a different fabric over its spine. So now that this is the second Sydney Writer's Festival zine fair in as many years, can we assume it's now going to be a regular feature on the Festival's program? Hope so. ...or at least it feels that way right now! Throughout May and into June, there appears to be a different market on every weekend. Last weekend I had my stall at the Hope Street Markets (my second HSM... I also had a stall at the Summer market in early February), and it sure was a busy busy busy weekend. Held in a new *bigger* venue, the Paddington Town Hall, the variety of products on offer was fantastic, and the crowds enthusiastically piled in. Terrific weekend, and my big 'thanks' to Jojo for coming down from Brisbane to help me man the stall both days. ^ an overview shot from the balcony at one end of the hall. ^ Jojo hard at work! ^ me on the stall, before the crowds came...! This weekend - Sunday 25th May - is the zine fair hosted by the MCA (Museum of Contemporary Art) in the Rocks from 11am until 6pm (as part of the Sydney Writer's Festival). There'll be about 50 or so stalls, and while its focus is supposedly zines, there'll certainly be a lot more on offer. I'll have my Shelbyville stall there, with all its variety of goodies, so please drop by and say hello if you're in the vicinity. Expect also to see some live music, artist talks, and of course the MCA exhibitions while you're there. More details available on the MCA website (link above). Next weekend - Saturday 31st May - is the Mister Market at the Penrith Regional Gallery from 12-4pm. Timed to coincide with the gallery's 'contemporary masculinity' exhibition, the Mister Market features "macho mercho" as well as the usual variety of handmade, artistic things. Should be a nice day out, even if it is a bit of a trek out of town...! So we just got back from a week in the great southern cultural haven that is Melbourne. And in true Melbourne style, it was grey, rainy, and utterly freezing cold - but that didn't inhibit this intrepid adventurer. 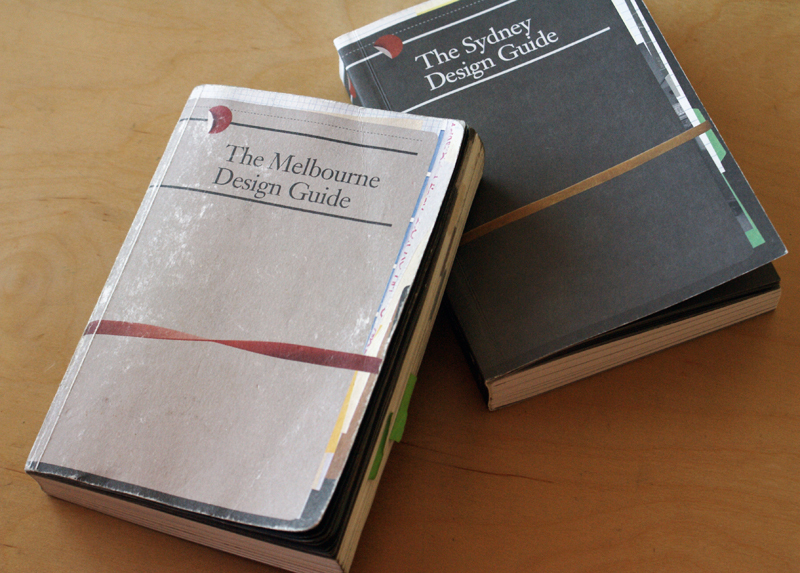 My beloved Melbourne Design Guide received plenty of use, and is now looking very, very worn-in indeed. In comparison, my near-new Sydney Design Guide is yet to see such action (and oh, but it will)..! Highlight #1 > The 3hr 'Walk to Art' tour where our guide, Bernie, introduced us to a whole raft of new arty spaces: a hidden gallery in the backstreets of Chinatown (an artist-run initiative called TCB); an upstairs artist's studio in Fitzroy; a wander through the enchanting Nicholson Building on Swanston St; a glimpse at a "gallery space" inside a row of old wooden mailboxes (see pic below); a drop-in to Craft Victoria to see a typography exhibition; down and through a myriad of laneways and subways glimpsing art installations and street art all the way; and finishing with a scrumptious platter of cheese and wine at the delightful Bar Lourinha. 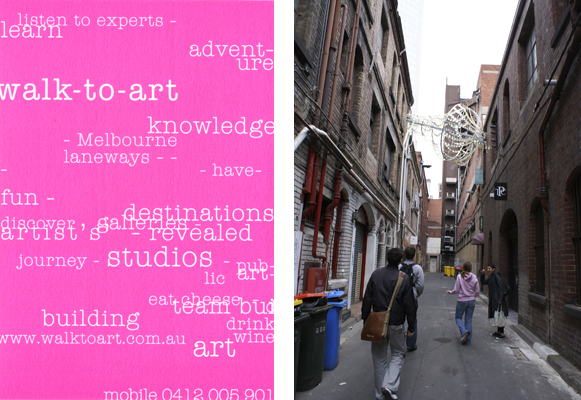 Highlight #2 > The Rose Street Artists Market, held in a carpark/warehouse space down a backstreet in Fitzroy. Those lucky, lucky Melbourne people! 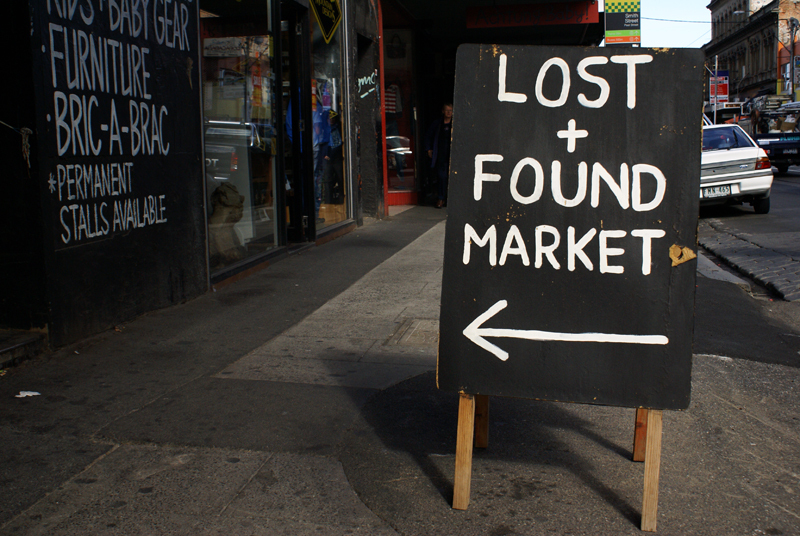 In Sydney we get the Hope Street Markets once every 3 months, but in Melbourne they get an art + design market every week. And it's really good too. Lucky buggers. Highlight #3 > The Medieval Imagination exhibition, currently showing at the State Library of Victoria. A whole room full of beautiful, sparkly, illuminated manuscripts. Has to be seen to be believed! And it's free! 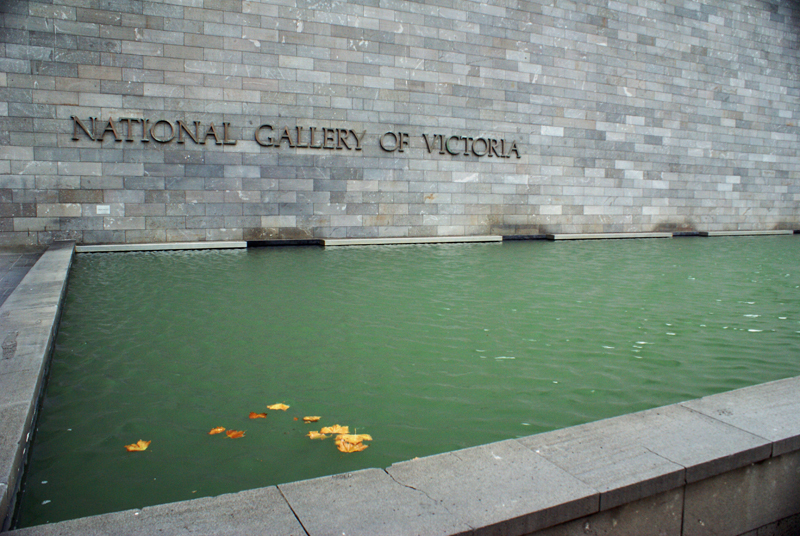 Highlight #5 > My first ever visit to the National Gallery of Victoria (coming straight from the ACCA - Australian Centre for Contemporary Art just around the corner). Wow, the NGV was incredible, architecturally and artistically. There's quite a mix of exhibitions too - I saw everything from breathtaking oil masterpieces (such as the dramatic painting pictured above), sculpture, decorative arts, contemporary Asian photography, and magical calligraphic ink paintings, right through to shocking WW2 etchings by Otto Dix. Oh, and the gallery store is nearly as remarkable as the gallery. Highlight #6 > bar crawling!! DD and I visited another few new bars - this time around we tried out the Gin Palace, the Order of Melbourne, Cookie, the Toff in Town, and Murmur. Almost went in to the Workshop bar, but heavy metal music ain't really my thing so we gave that one a miss. The Order of Melbourne (pic on the left) had the best vibe! Murmur offers some fantastic cocktails (pic on the right). Highlight #7 > Finally, finally getting to see Pushka OPEN..! God knows I've been disappointed half a dozen times on previous visits, but finally I have now seen it open and enjoyed its alleyway ambience whilst sipping my 30th Melbourne latte chased down with a yummy Portugese tart (with chocolate inside!). Hooray! It's the little details that I like about Pushka - a grassy front-door mat, a cushy seat on the stair, little framed pictures adhered all along the alley wall, a miniature window 'gallery' called Twenty by Thirty (its dimensions in cm)... Good coffee too. Highlight #8 > Ok, this might even have been my favourite find, if only because we just happened to stumble across it as a lovely little surprise whilst walking along Smith Street, Collingwood. 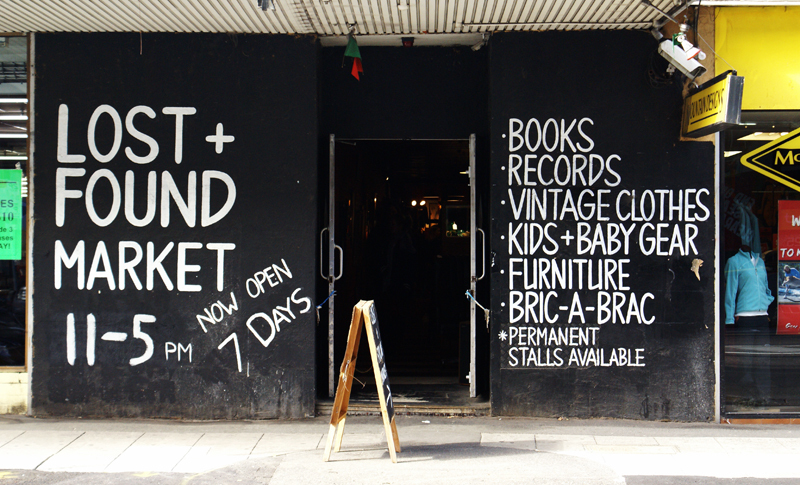 Housed in what used to be a disco in a former life, it is now the wonderful Lost + Found Market, full of delightful secondhand vintage things just waiting to be rummaged through. I found myself a little Japanese recipe box and a wooden box of Conte crayons. Cool place - definitely drop by if you're into vintage things.